This weekend marks 100 days into the Trump administration. It has been a whirlwind. Every week seems to have a new attack: on refugees, on immigrants, on Muslims, on the environment, on regulatory agencies, on hard-won advances like net neutrality. And, when it comes to trade policy, every week seems to have a new rumor. One thing is clear: our vision of a fair trade policy –one based on global cooperation and not competition, one based on protecting workers and the environment and public health, one based on limiting corporate power– does not seem to be shared by the current administration. This weekend, stand with us, with workers, immigrants, and the environment for a shared vision of a fair and just future. Earth Day to May Day week of action: A series of teach-ins and actions all across WA connecting climate change, workers rights, and migrant rights. Check out the calendar of events here. People’s Climate March: Saturday April 29, march for equitable climate action in towns and cities across WA. Find a march near you here. 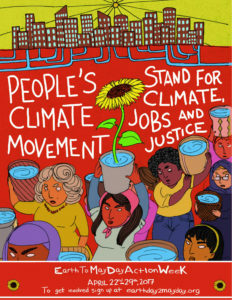 People’s Climate Action Summit: Saturday April 29, in Seattle. A half-day of workshops, arts, and skill building after the Seattle Climate March, from 12-5:30 PM at Seattle University. Organize, share, and deepen relationships between communities and organizations working to build intersectional climate action. Event info for the Summit here, and facebook event here. Check out our 2PM workshop, “Make it Global: Using Trade Policy to Fight Climate Change,” to help us build our people’s platform for progressive trade policy! Climate Justice Contingent Pre-Rally and May Day Seattle March: Join us at the Judkins Skatepark at 10AM for a short pre-rally with speakers on the intersections of climate change, workers rights, and immigrant rights. We will then march together as a “solidarity contingent” up the hill to the May Day Main Stage at Judkins Park to join with the Annual May Day March for Workers and Immigrant Rights. RSVP for the climate justice pre-rally here, and for the main Seattle May Day march here! There is also a May Day March in Yakima, check out the Yakima May Day March for Immigrants here. See you at gatherings, workshops, and in the streets!